The transformative learning experiences at Leap 2 Learn Educational Childcare are designed to help our students grow both in and out of the classroom. Established in 2017, Leap 2 Learn Educational Childcare is located in Rapid City, SD and reflects the vibrant energy of the area. Our passionate and skilled team members are here to help our students make an impact on the world. From our child care to preschool programs, our day care center is designed to promote each child’s own individual social, emotional, physical, and cognitive development. We believe that fostering the development of competence in intellectual and social skills and providing a safe, nurturing environment that will create life-long learners. As educators, we value the uniqueness of each child we serve. Leap 2 Learn will create tomorrow’s future through our passion to educate children and build strong relationships with all the families. 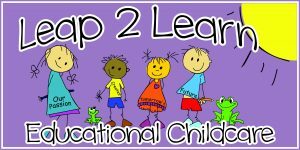 Leap 2 learn provides engagement with Social, Emotional, Health, and Physical, Cognitive, Communication, Language, and Literacy development through the South Dakota Early Learning Guidelines. The curriculum is developed through extensive assessment, group and individual goals, and appropriate activities that promote healthy development. Our educational childcare and day care center implements our vision and curriculum in everything we do.